Lexus has always been among the stodgiest luxury car brands, but that might be about to change. Toyota Motorsport GmbH (TMG), the Japanese company’s German engineering and motorsport division, is cooking up quite the hot rod for the Essen Motor Show. Dubbed TS-650, this LS-based sedan reportedly boasts around 600 horsepower, and a top speed of over 200 mph. The main ingredient in this Molotov Cocktail of a car is its engine. Earlier this month, TMG spokesman Alastair Moffitt told Motor Authority that the TS-650 will pack a 5.0-liter V8 with at least 600 horsepower. Lexus already puts a 5.0-liter V8 in the IS-F, although it could also increase the displacement of the regular LS’ 4.6-liter unit. 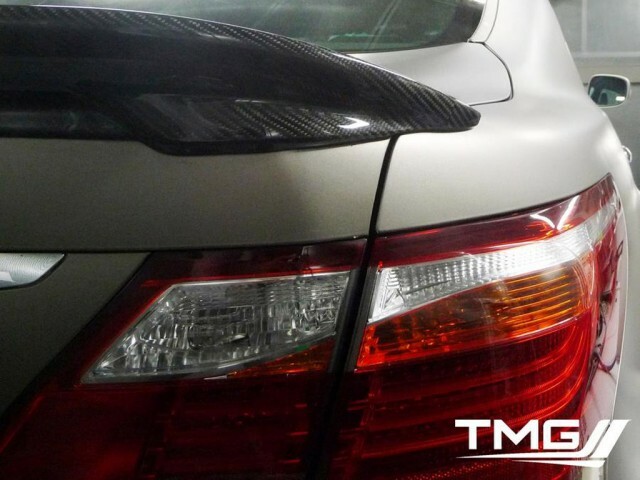 Based on the teaser images just released by TMG, it seems attempts were also made to lighten the TS-650 with carbon fiber. The car sports a carbon fiber trunk lid spoiler, roof, and side skirts. It also reportedly has widened fenders to accommodate larger wheels and tires. If it really can top 200 mph, the TS-650 could claim the title of world’s fastest sedan, although this one-off doesn’t really qualify as a production vehicle. The TS-650 is apparently road-legal, although Toyota’s plans for the car are unclear. It may just be a special project intended to jazz up Toyota’s display at Essen. If it attracts enough attention, Toyota might want to consider turning TMG into a dedicated performance division, like BMW’s M and Mercedes-Benz’s AMG. TMG is well qualified to be Lexus’ AMG. The division has managed Toyota’s racing programs since the 1970s. It has campaigned everything from World Rally Championship Celica GT-Fours to the TS030 Hybrids that competed in the 2012 24 Hours of Le Mans. A line of true performance vehicles (unlike the current lukewarm F-Sport models) would really help Lexus compete with the Germans model-for-model, and in terms of prestige. It would give Lexus something Toyota doesn’t have, distancing it from the cheaper brand. Of course, this isn’t the first wacky prototype Lexus, or the first Lexus performance car. In 2003, Lexus shoved a V8 in an IS to create the IS 430, which into the production IS-F. It also built the insane, $381,000, V10-powered LFA supercar. The IS-F and the LFA were a bit too unrefined, and expensive, to really take on established competitors. They were very left field, and so is the TS-650; hopefully TMG and Toyota can make this dream machine relevant off the auto show stage. We’ll first see the hot rod Lexus at the 2012 Essen Motor Show, which opens November 30.